What we are seeing, here and now, is the transformation of the atmospheric physics of this planet. Arctic heating, the paper shows, both slows the Rossby waves and makes them steeper and wider. Instead of moving on rapidly, the weather gets stuck. Regions to the south of the stalled meander wait for weeks or months for rain; regions to the north (or underneath it) wait for weeks or months for a break from the rain. Instead of a benign succession of sunshine and showers, we get droughts or floods. The Florida Panhandle/Alabama flooding and the recent rash of tornadoes were caused by a Rossby wave blocking pattern. Connect the dots, folks, from Arctic melt to Florida flood. To get five times the typical monthly rainfall in roughly 24 hours is mind-boggling. The overall storm system was monstrous. A strongly pronounced kink in the jet stream has been effectively stuck in place for days, held fast by a sluggish dome of high pressure over Hudson Bay in Canada. As I wrote earlier this week, blocking patterns like this are known for their ability to create extreme weather. New evidence of Rossby Waves creating extreme weather. ... the weather extremes they examined were month-long heat waves, cold spells, droughts and prolonged wet periods, which occurred over large areas. 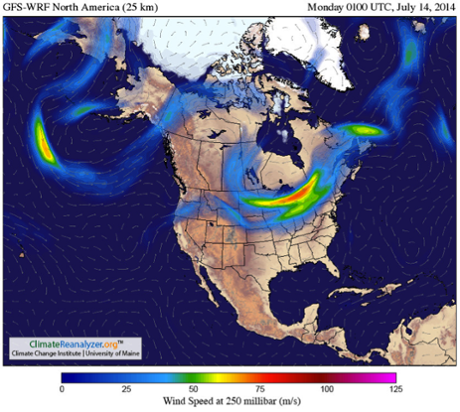 This set of images nicely illustrates how a deeply curved jet stream can simultaneously bring 90°F weather to northern Canada and cold air to Minnesota. The Jet stream has ruptured! The "refrigerator door" separating the Arctic is off the hinges, so to speak. Wind is blowing from Hawaii, up through the Bering Strait, right across the Arctic Ocean, and down into the Atlantic on the other side. the Bering Strait and on over the polar zone. Still confident the Arctic won't be ice free this September? So far 2014 has been a record year for weather extremes in the US, due to the Jet Stream being "locked". Normally a year is colder than average or warmer than average. This year we had both at once, as if the country were in two different climes. An Omega Block will sit on the US for two weeks. The jet stream is shaped like an omega, bending from Siberia down to Hawaii and back to north Alaska, then down again to the Midwest and East. 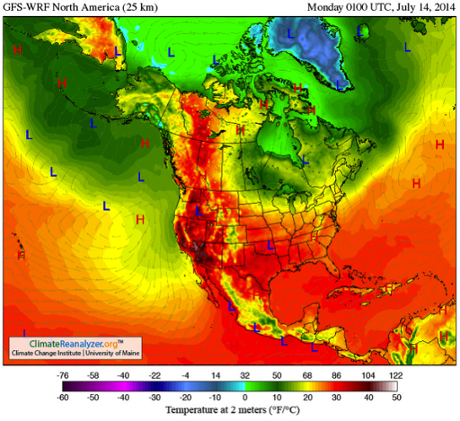 Alaska's north slope could see 50° while Montana gets weather 50° colder than usual. Atlanta will be colder than Barrow! ... the temperature extremes this particular pattern will produce are nothing short of breathtaking. In Great Falls, Montana, Tuesday’s high temperature is expected to top out at ... nearly 50 degrees below normal. Meanwhile, Barrow, Alaska—the northernmost city in the United States—will spend most of the week some 20 degrees above normal, with highs of about 30. With Inhofe in charge of US climate legislation, how much more could the Jet stream bend in the next four years? As if this weather were not surreal enough. 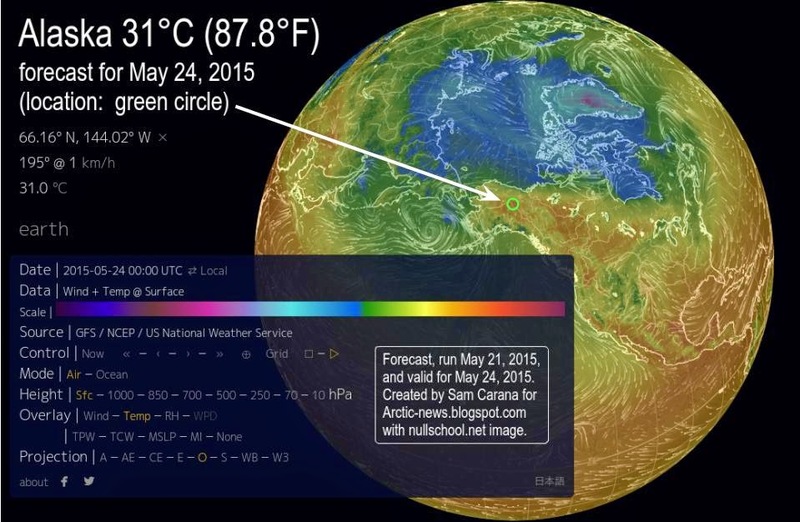 Temperature departure from normal in the Arctic for this time of year is astonishing. Another positive feedback has been quantified, that accelerates Arctic warming. By now you're aware that Rossby waves are deeper due to Arctic sea ice melt and Arctic warming, pulling cold air down into the US midwest and warm air up from Hawaii into the Arctic. This Hawaiian air "adds an extra heating to the Arctic air column equivalent to about 60% of the direct surface heat release from the sea-ice reduction." The results from the simulation reveal that the recent Arctic sea-ice reduction results in cold winters in mid-latitude continental regions, which are linked to an anomalous circulation pattern similar to the negative phase of AO/NAO with an increased frequency of large negative AO events by a factor of over two. Associated with this negative AO/NAO phase, cold air advection from the Arctic to the mid-latitudes increases. We found that the stationary Rossby wave response to the sea-ice reduction in the Barents Sea region induces this anomalous circulation. We also found a positive feedback mechanism resulting from the anomalous meridional circulation that cools the mid-latitudes and warms the Arctic, which adds an extra heating to the Arctic air column equivalent to about 60% of the direct surface heat release from the sea-ice reduction. The results from this high-top model experiment also suggested a critical role of the stratosphere in deepening the tropospheric annular mode and modulation of the NAO in mid to late winter through stratosphere-troposphere coupling. Pacific Typhoons make the jet stream go crazy, another Climate Destabilization feedback. I was astonished to see the Jet Stream split, merging with the Subtropical Jet Stream to the south and simultaneously flow over the North Pole. "May You Live in Interesting Times," indeed. 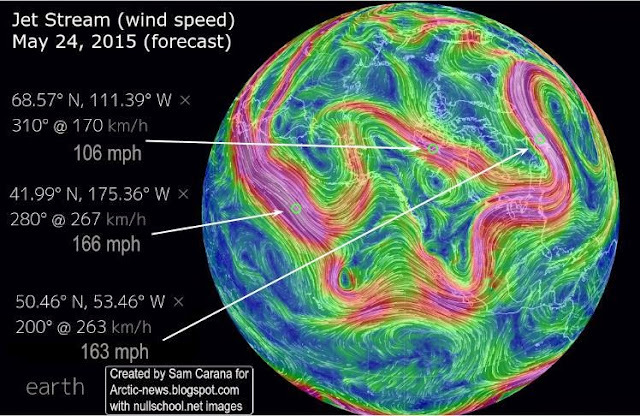 Recent Typhoons Noul and Dolphin did this to the Jet Stream. ... a greater impact of cyclones on the jet stream can be expected as a feedback of global warming. The Jet Stream is forecast to loop up into the Arctic Ocean from Russia this week, bringing warm air to melt snow on land and sea ice. Substantial snow melt is anticipated. Note the blue disappearing over large areas of the currently frozen Arctic Ocean. Early snow melt creates ponds on the ice which absorb more heat. When Jet Stream waves bring warmth to the Arctic at this time of year, it initiates a feedback. ... more sea ice melt results in higher amplitude wave formation in the Jet Stream. Higher amplitude wave formation in the Jet Stream transports more warmth to the Arctic environment, resulting in more sea ice and snow melt which in turn weakens the Jet Stream further. Omega Block: a stalled Rossby wave crest (that causes extreme weather). Don't be confused by the different names. Extended hot dry weather set Fort McMurray up for the worst wildfire disaster in Alberta's history. 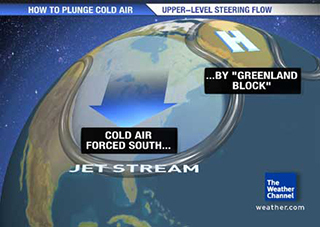 High jet stream crests "get stuck", sending warm air north. When an Omega Block sits on Greenland, it's often called a Greenland Block. ... it is only May — not July when such extreme fire weather would typically be possible. ...given the fact that it will grow still hotter and drier in the months ahead, it looks like Fort McMurray — a city in the grips of the hard climate consequences it helped to create — is in for a long, rough fight. In February 2016 the quasi-biennial oscillation changed direction unexpectedly. Robert Scribbler attributes this unprecedented change in high level Equatorial wind to deep Rossby waves [also called gravity waves or atmospheric waves] pushing on them. This is the first time that polar amplification has impacted high-level Equatorial winds through jet stream changes. The equatorial wind field and atmospheric mass ... is typically the region with the greatest atmospheric inertia. Uneven relative warming of the surface of the Earth may result in some unexpected changes to larger atmospheric circulation patterns. Scientists now indicate that future flips in Equatorial wind patterns, like the big switch that occurred this past winter, may be driven by such atmospheric warming. There is a possibility that the recent flip was related to large atmospheric waves which are potentially a result of polar amplification. His article also includes a video of Jennifer Francis discussing how a Rossby wave that's so deep it cuts off from the main Jet Stream to form a loop, like a turbulence eddy, forms a blocking pattern. She mentions how this impacts the UK weather in particular, as blocks form frequently over the North Atlantic.